Rob Roy Country Walk, Strathyre Forest, Beinn an t-Sidhein, Balquhidder. Join the outlaw Rob Roy Macgregor on an adventure through Strathyre Forest and on to the summit of Beinn an t-Sidhein. You can't go far in the Trossachs without stumbling upon reference to the area's legendary hero, Rob Roy Macgregor. A famous riever and retriever, he stole cattle from the wealthy landowners and distributed the proceeds to the poor. If the hills and woodlands of the Trossachs could speak, they'd doubtless all have a tale to tell. Born into the warring Clan Gregor in 1671, Rob Roy swapped life as a simple farmer for an altogether more exciting career battling the nobility who threatened to crush his way of life. 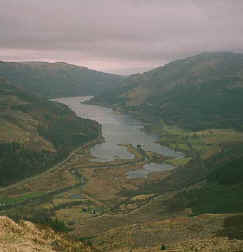 Rallying his men, Rob Roy raided the fertile Carse of Stirling, plundering cattle. Although he was caught three times, he always managed to escape. After a turbulent career, he died in 1734 and is buried with his wife Mary and two of his four sons at the tiny kirk in Balquhidder. His legend, however, lived on and has inspired novels and films. Rob Roy's grave is just a stone's throw from Beinn an t-Sidhein and there is every chance he scaled this peak at least once during his reign. Today's walker has the luxury of a waymarker path but the spectacular views from the summit remain little changed. Leave the car park by its entrance, turn left and follow the A84 road north through Strathyre. Pass by the village shop and a bus stop and then turn left on a minor road opposite the Munro Hotel. This crosses the River Balvag by an old stone bridge. Carry on to a T-junction ahead. Turn left here and, a few yards on, there's a signed forest walk path on the right. Follow the blue marker posts as the way rises quite steeply up the hillside, passing through dense coniferous Strathyre Forest. The path emerges on to a forest track. Turn right and a short way on there's another waymarker on the other side. Leave the forest road here and follow the path back into the trees and up the hill. Not far on, you reach another track. Again following the blue marker, turn left here and continue up, remaining with the main path and ignoring smaller paths branching off on each side. Stay with the blue waymarkers and the route finally leaves the woods and rises on to open hillside. When the path forks, take the path on the right which climbs over the southern flank of Beinn an t-Sidhein to reach the top. Continue north along the path over a couple of humps to Buachaille Breige, a craggy outcrop at the end of the broad ridge. Descend north, bearing right towards the edge of the forest until you reach an easy to see break in the trees. Within the trees, pick up a forest track and continue your descent until you join the public road just south of Stroneslaney, a small cluster of houses sitting up from the banks of the River Balvag. Turn right and follow the road south. It's single carriageway and fairly quiet, but keep your eyes open for traffic. The road cuts through tall woodlands of pine and there are some lovely tranquil strips where it is hemmed in my moss-covered stone walls. In due course, it arrives at the T-junction. Retrace steps through Strathyre to the car park. Map OS Landranger 1:50,000 sheet 57. Start/parking Public car park at south end of Strathyre (NN 560167). Grading Forest path and track with waymarkers and open hillside suitable for all fairly fit walkers.